March 13th in Gennett History, 1923: the New Orleans Rhythm Kings recorded “Tin Roof Blues” in Richmond. This historic session appeared on Gennett 5105, Buddy 8001, Starr-Gennett 9435, Temple 521, and UHCA 87. The track featured Paul Mares (c), George Brunies (tb), Leon Rappolo (cl), Mel Stizel (p), and Ben Pollack (bjo). 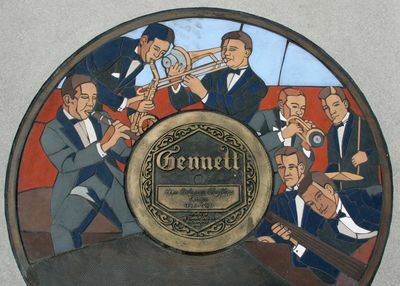 This entry was posted in Gennett, Gennett Walk of Fame, March, Video and tagged Ben Pollack, Buddy 8001, Gennett, Gennett 5105, Gennett Discography, Gennett History, Gennett Records, Gennett Walk of Fame, George Brunies, Leon Rappolo, March, Mel Stitzel, New Orleans Rhythm Kings, Paul Mares, Starr Gennett, Starr-Gennett 9435, Temple 521, Tin Roof Blues, UHCA 87. Bookmark the permalink.